© Dennis Jarvis. Used under Creatives Commons License. Sometimes the happenings of this world feel beyond what the heart can bear. A beloved comedian’s tragic death. Reports of horrific conflict and genocide in the Middle East, with many of the victims children, their pictures transported thousands of miles across oceans to verify the reality of carnage. Closer to home, this moment, a family gathers at the deathbed of a dear husband, father and grandfather whose body succumbs to cancer, none ready to part with him. Tragic pain. Heartrending loss. Inner and outer turmoil that the spirit in its purest place knows don’t belong in this world, really. As parents we shudder and push through our days. As love-invaded friends of God we offer silent prayers framed with unspoken questions. And then a child’s query breaks the silence. “Why did he die? What happened?” And we have to find words somehow that are truthful and that teach. I smile at a child’s simple resolution to problems and his belief in uncomplicated happiness-ever-after. If only … And then I think about Bartimaeus, the blind man who Jesus healed. We read about him together with Good Dirt a few nights ago. Bartimaeus received his sight “and followed Jesus along the road, ” according to the Gospel of Mark. He begged Jesus for mercy, received it, and then followed the Savior. It wasn’t complicated. I’m not sure if Bartimaeus lived happily ever after, but in following Jesus he had what he needed most. The evil in the world certainly raged on–Jesus would soon be killed, and death eventually came to this follower, but a bigger reality encompassed Bartimaeus. His life was hidden not in a dungeon or a castle, but with God in Christ for each moment and into eternity. He couldn’t be touched by a mean rat (as in Derrin’s tale) or an act against himself, a sword or invading bodily cells. Following Jesus put a greater reality in place. We still stand against evil and illness, yet as we do we seek more and more to know Jesus’ mercy in our lives, as Bartimaeus did, and to speak His mercy and life to a hurting world. © Eric Kilby. Used under Creative Commons license. Every summer our family spends a week with extended family, where about 14 of us gather in one big cabin in a small, mountain town to play, sleep, and eat together. We watch hummingbirds from the kitchen window, walk many times a day down dirt roads to visit the lake, throw rocks in the river, and catch fish. It’s a slice of idyllic life and a time we look forward to all year. This past week we spent the 4th of July together in this spot, and in the flurry of packing I forgot to include our copy of Good Dirt. We have nine kids between the three families, ranging in age from 7 to 19. Several are teenagers, and last week as we got two or three days into the week some of them were needing to slow down and consider their words and their attitudes. It seemed apparent that even in idyllic locations we all need the Word and the Spirit of God to speak and guide our living. 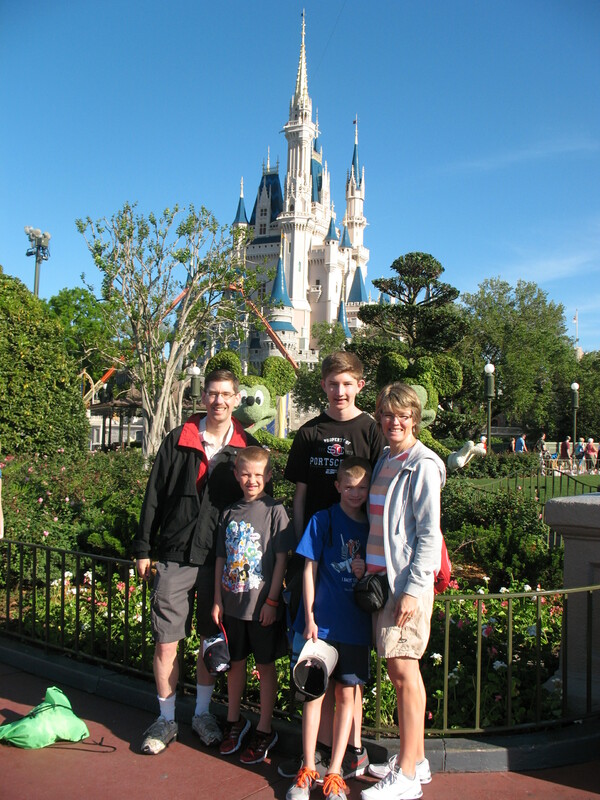 Even vacation days and cousin time need the breath of Life we get only from time with God. With no Good Dirt, my mind turned to the letter of 2 Timothy, which was the book our church had been focusing on in a Bible reading plan we were doing together. “Who knows who wrote the book of 2 Timothy? And who knows where he was when he wrote the book? Who was Timothy and why was Paul writing this letter?” We talked about all these background details and then read chapter 1. The little kids knew this verse. Where did they learn it? VBS last summer! It was the theme verse and they remembered. We all talked about how God’s Spirit supplies us with these important qualities–power, love, and self-discipline. We talked about what it means to be holy, to belong to God and to live differently than some others in the world live. And then we prayed together. One of the teens volunteered to lead us. We probably spent fifteen minutes talking and reading. Not a real long time. But I realized something that morning. Because our immediate family has been reading the Bible and Good Dirt these last six months, that time with the kids felt easy and natural for me as a parent. 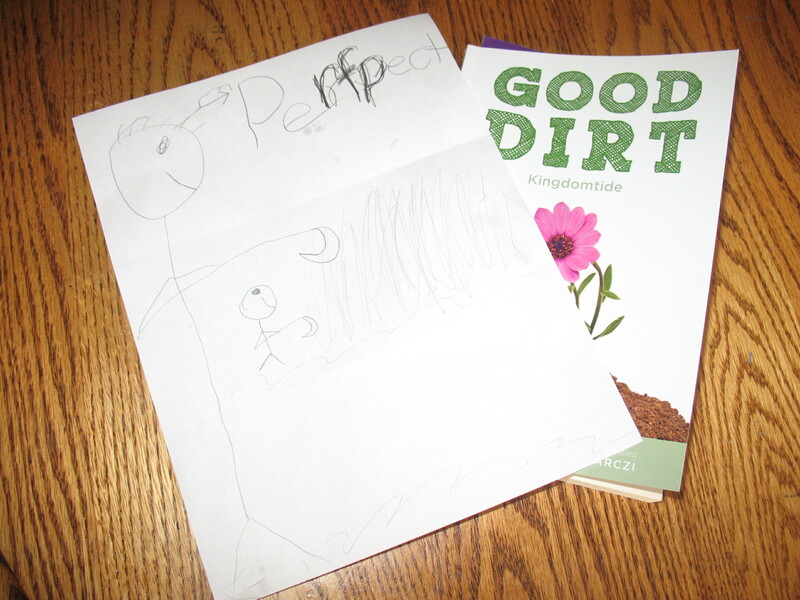 I didn’t need Good Dirt to prompt the questions or set the agenda for our reading. And I wasn’t worried about what to do or say with the kids. It all flowed pretty easily. I think that is the ultimate goal of Good Dirt. Lacy and Ben haven’t said it in so many words, but isn’t the best part of a devotional like this the way it helps us as families enter into God’s Word together and let God form us, most of all through the prompting of the Spirit? The way we learn to spend time in the Word and with Jesus together so much more readily and naturally, no matter where we are or who is with us? Thank you, God, for the beauty you bring to our lives when your Word enters us and colors our days. Your beauty surpasses all. I’ve just returned home from bringing two of our boys to church camp for the week. Our other son is already away for a second week of training for a children’s evangelism ministry he’s taking part in this summer. And so, the house is quiet. We brought a neighbor boy and two neices along to camp, and all the way home as I drank in the blue Colorado sky with forests of evergreen and aspen, roadside streams and meadow flowers stretching mile after mile, I thought about each of the kids and each of their little personalities and passions, their gifts and their callings. We read Good Dirt and the Bible this morning after final packing, and the passage we read from Luke 20 talked about a vineyard and unfaithful workers who mistreated all the servants sent by the owner of the vineyard to bring back fruit. They even killed the owner’s son. As I drove today I thought about my own process as a girl and young woman of learning who I was and learning how my growing passion for God could best be lived out in this life He’d given me. I remember road trip vacations as a child when we listened to a couple cassette tapes of country music over and over and over to pass the time–and how I realized later that this style of music, though my parents’ favorite, definitively was not “me.” I remember my dad’s encouragement toward the study of law as I entered college, and how I wrestled with his prompting but determined I wasn’t created for this profession. Just two random examples, but they remind me that my kids, and each child I know and love, is created to meet God in particular ways and to work alongside God in ways fitting so rightly for him or her. I pray this week that my two boys at camp, and my teenager sharing the Gospel with kids, will keep learning who they are and how they can best meet God. I pray they experience ways of loving God and worshiping him where they’re at this week that fit who they are. And I pray they learn just a little more about how God has formed each of them to work with him in his vineyard. I pray they pursue a life where they know God is smiling as he works alongside them, even in them, and where they sense him whispering something along the lines of “Perfect!” as they are glad together. I’m guessing that most parents who are following Jesus and helping their kids to live with him struggle in the same way I do. Lately, I’ve been thinking a lot about who and what is most influentially forming my three kids. When I say “forming,” I mean forming them spiritually in a way that affects their identity, their passions, their understanding of living and being in this world, their view of God and what He means in their life. God, though, through the Holy Spirit’s whispers in response to my thoughts, has affirmed again and again that the Quinns are where He’s placed us as a family and we are to choose carefully within this context how we will influence our kids’ formation day by day and year by year. Good Dirt. It has been a good and powerful family guide into God’s Word and life with Him on this daily journey. Last week we focused with the kids on Jesus’ prayer in the Garden of Gethsemane, and the boys drew pictures that they used for a few nights. The boys were instructed to draw a road, because Jesus described himself as the road to God. “With his whole life he showed us how to live a life with God.” And then they were told to write on the road some of the ways Jesus showed us how to live a life with God on the road. For three nights we read from Jesus’ prayer in Gethsemane, talked about it, and wrote on the pictures. On Night 3 as we began to talk about that very-religious-sounding word sanctify, I realized that God is so “with me” on this hard road of parenting and of yearning for my kids to be formed by God and not by the world. Of all things, just a day or two earlier I had heard a radio preacher talking about sanctification. Being sanctified, he had said, is being “set apart.” His words had stuck with me, and that night with the boys this definition was ready and helped to frame our conversation. It gave us a picture of who we are as people who want Jesus as our Life. We are different. We are chosen. We, indeed, are ones who are set apart, belonging to God. When I was a teenager and going through family crisis, a friend gave me Oswald Chambers’ devotional book, My Utmost for His Highest. I dove into this classic book that focuses so deeply on sanctification. I underlined like crazy and I prayed a lot that God would work out this process of sanctifying my life for Him. Chambers is more wordy when he talks about sanctification, but just like the shorter definition, he gets to the heart of what God does in us, if we allow it. This idea of being set apart, though, isn’t too big or too incomprehensible for my kids. Even on a night when they are a little distracted, are trying to fidget with each other, and one is dissatisfied with his drawing, I know they get it. I know they can understand that it’s really special to be set apart. And that God deserves all of us. So today, and again tomorrow, we enter another day seeking to live it all, and give it all, for Jesus, for we are “not of this world.” And we’re also not doing any of it without God’s help. ***Parent friends and readers–It is a comfort and much-appreciated joy to walk this road of parenting with you, in community with you through the writing at this site. We are all in different places with God and with our kids as we parent. If you sense Jesus drawing you to come to know Him as you read here, know that you and your children, too, are chosen by God to belong to Him. You and your kids can come to know God by praying simple prayers to God together and by reading the Bible together, listening to God speak to you. Any of us who are writing here would love to correspond with you, just as a follower of Jesus who lives near you would also love to do. Reach out–we need each other as we journey with God! It’s those bedtime questions that can require the very most we have to give. I remember hearing Chuck Swindoll say one time that for parents, it’s those moments we’re tucking them in when kids are the most talkative. Don’t rush through bedtime with your kids, he encouraged. They’ll do anything to delay switching off the light. Talk to them. Listen to them. Take advantage of their open hearts and listening ears no matter how tired you are and no matter how ready you are to be done with parenting for the day. Austin, my 11-year-old, asked this one as I was giving him a final kiss at the end of a trying day, to put it mildly. Our 8-year-old had been through two meltdowns, our high schooler had been home sick from school and then had gotten his braces tightened. We’d been to music lessons which meant a late dinner. The boys had been squabbling. Fishing poles and line were spider-webbed around our family room in an effort to de-tangle. And Austin and I had just finished studying for a surprise test. It was time for bed. Now that I’m rested and the fishing poles are put away, I’m thinking a little more coherently. Not about my words to Austin, but about this place of mystery in our lives. The way we all deal with the unknowing that is an undeniable part of our Christian faith. As parents, and as people in relationship with God, we want to nail down the answers. We want to figure it out and learn it so we can defend it, and more, so we can live in an inner place of comfort. I’m reading a book that pokes at this tendency of ours to want neat and tidy answers. To be neat and tidy people. It’s titled Chasing Francis by Ian Morgan Cron and is the fictional story of a pastor who has a breakdown of sorts and travels to Italy to encounter Francis of Assisi in his millenia-old surroundings. That night with Austin and a house full of tangle–it was the right night for a question without a good answer. It was the right night to remember Jesus’ agony in relationship with his Father. And, perhaps my weary attempt was what it needed to be. The mystery of God, the cries of our suffering Servant, and the untidiness of me–they’re things my kids need to see. And that image of the cross, I hope it comes to mind every time I’m spent and need to share just a little more of myself.